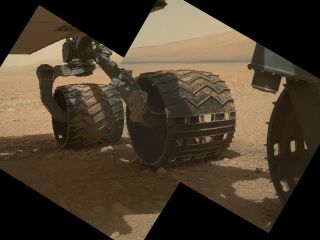 This view of the three left wheels of NASA's Mars rover Curiosity combines two images that were taken by the rover's Mars Hand Lens Imager (MAHLI) during the 34th Martian day, or sol, of Curiosity's work on Mars (Sept. 9, 2012). In the distance is the lower slope of Mount Sharp. NASA's Mars rover Curiosity is doing a bit of mechanical navel-gazing on the Red Planet, snapping ultra-clear pictures of itself while testing a powerful camera at the tip of its robotic arm. The stunning new Mars photos by Curiosity show detailed views of its wheels and underbelly, a self-portrait of the robot's head-like camera mast and even a snapshot of an odd bit of Americana — a 1909 Lincoln penny used for calibration — that hitched a ride to the Red Planet with the rover. This view of the calibration target for the Mars Hand Lens Imager (MAHLI) aboard NASA's Mars rover Curiosity combines two images taken by that camera during the 34th Martian day, or sol, of Curiosity's work on Mars. This image was taken Sept. 9, 2012. The Curiosity rover took the photos over the weekend using its Mars Hand Lens Imager, or MAHLI, which is a focusable color camera attached to an instrument turret at the end of Curiosity's 7-foot (2.1–meter) robotic arm. MAHLI snapped its first photo of the Martian surface without a protective dust cover on Saturday (Sept. 8), and then began taking clear pictures of Curiosity itself a day later. On Sol 32 (Sept. 7, 2012) the Curiosity rover used a camera located on its arm to obtain this self portrait. The image of the top of Curiosity's Remote Sensing Mast, showing the Mastcam and Chemcam cameras, was acquired by the Mars Hand Lens Imager (MAHLI). Another snapshot, taken on Friday (Sept. 7), captures a dusty view of Curiosity's camera mast. The photo appears hazy not because of a dust storm, but because the dust cover on MAHLI was closed at the time. The MAHLI device is designed to serve as a microscope-like magnifying camera for close-up studies of rock targets, and it has a resolution of about one 1,000th of an inch (14 microns) when held within an inch of its target. By changing the MAHLI camera's focus and its position (by moving Curiosity's arm), rover mission scientists expect to be able to take time-lapse views of Mars and examine rover hardware while on the Martian surface. "The main purpose of Curiosity's MAHLI camera is to acquire close-up, high-resolution views of rocks and soil at the rover's Gale Crater field site," NASA officials wrote in one image description. "The camera is capable of focusing on any target at distances of about 0.8 inch (2.1 centimeters) to infinity, providing versatility for other uses, such as views of the rover itself from different angles." Veteran space camera builder Malin Space Science Systems of San Diego, Calif., built the MAHLI camera on Curiosity for NASA. The camera snaps photos using a red-blue-green filter, much like commercial digital cameras on Earth, and stores them in an 8-gigabyte flash memory for transmission to Earth. The camera relies on a charged-coupled device (CCD) image detector that uses a 1,600 by 1,200 array of active pixels, according to a NASA description. As the last step in a series of inspections of the Mars Hand Lens Imager (MAHLI) aboard NASA's Mars rover Curiosity, this camera's reclosable dust cover was opened for the first time during the 33rd Martian day, or sol, of the rover's mission on Mars. This image was taken Sept. 8, 2012. The MAHLI camera is one of 17 imagers on the Mars rover Curiosity designed to study the Red Planet in unprecedented detail, as well as provide vital views for navigation and hazard avoidance. The MAHLI camera and other instruments at the end of Curiosity's robotic arm are currently being put through a series of tests to make sure they are ready to begin up-close studies of Mars, mission managers have said. The $2.5 billion Curiosity rover landed on Mars on Aug. 5 and is expected to spend the next two years exploring Gale Crater to determine if the region could have once supported microbial life.